Go bananas in this over-the-top action shooter. 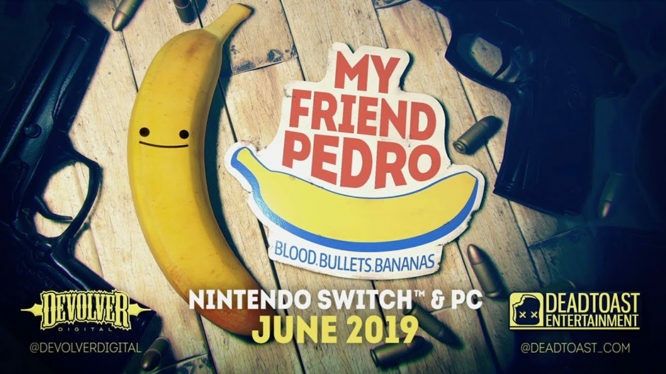 My Friend Pedro will officially be heading to Nintendo Switch in June 2019. The release date for this over-the-top action shooter was first announced during Nintendo’s Spring 2019 Nindie Showcase. Developed by Deadtoast Studios and published by Devolver Digital, My Friend Pedro is all about tackling each level as imaginatively as possible. Fittingly described as a “violent ballet of friendship” the game features an unlikely duo, an unstoppable man and a sentient banana, and together, they begin a campaign to end anyone in their path. Catapult yourself into the air and perform choreographed twists and turns while aiming both guns simultaneously in split-aiming fashion. Not stylish enough for you? Then burst into the room on a skateboard before ollying into the air and launch the skateboard into your opponent’s face. All the while, Pedro the banana will be there to accompany you for moral support. Originally announced at E3 last year during Devolver’s traditional press conference, this game instantly won over the hearts of many due to its quirky premise and over-the-top action. My Friend Pedro became one of the most highly-anticipated indies of 2019. Fortunately, the wait is almost over, since My Friend Pedro will be available on PC and as a console exclusive on the Nintendo Switch this June. The newest trailer, which packs in death-defying aerial tumbles and slow-motion hot breaches, is something you do not want to miss as it surely will make your day a thousand times more entertaining.